Sometimes you gotta bring the trendy restaurant dish home because the line-up is too long! A stock menu item, not to mention a family favourite, these ribs are irresistible and perfect to serve at your next dinner either as an finger food or with a warm bowl of rice. The credit goes to my talented mother who combined her two go to rib recipes from Mark McEwan and Food and Wine to concoct this devilish dish. In a small bowl, combine ingredients for the marinade. Rub all over the rack and place in a resealable plastic bag, minimum 2 hours, or up to overnight. Preheat oven to 375 F. Remove ribs from fridge half hour before cooking. Place the ribs in a shallow roasting pan. Roast for 45 minutes, or until cooked through, turning occasionally to ensure even cooking. Remove ribs and set aside to cool. Meanwhile, prepare the glaze. Place sugar and 3 tablespoons of water in small pot and bring to a boil over high heat. Resist the desire to stir. Once the mixture begins to turn golden, carefully add the remaining water, soy sauce, ginger and garlic. Cook for an additional minute then remove from heat. Be careful not to overcook because it easily burns. 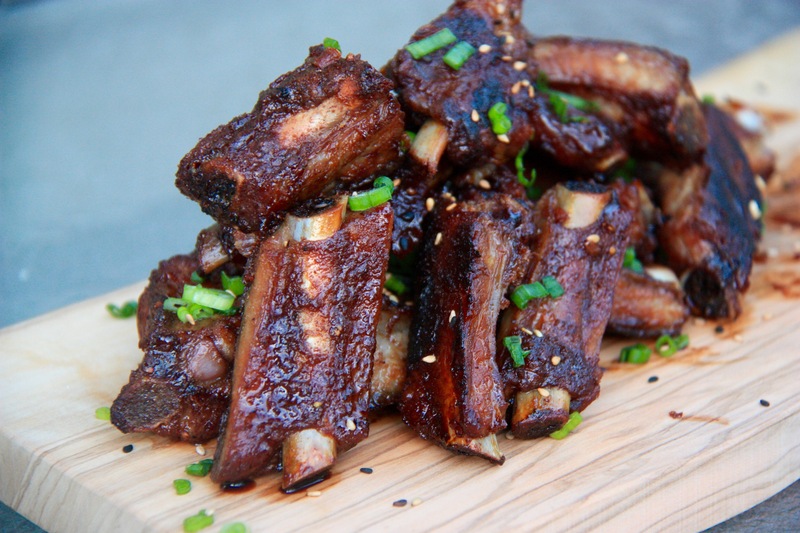 Once the ribs are cool enough to handle, place them on a cutting board and slice into individual pieces. If there is excess fat in the roasting pan, pour off and discard. Return the ribs back to pan and drizzle glaze on top. Place back in oven for 15 to 20 minutes longer, tossing frequently to prevent burning. Remove from oven and cool slightly. Garnish with green onions and sesame seeds. Serve and enjoy!